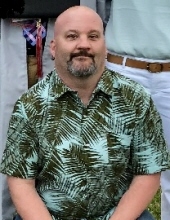 Rick “Hop” Hopkins, 46 of Belfast, passed away on April 11, 2019 surrounded by his loving family and friends. He was born on October 16, 1972 in Belfast. Rick fought a courageous battle of cancer. He always kept a positive outlook and wanted to keep people smiling. Rick has worked for Bank of American for 19 years. He was a diehard sports fan following the Boston Red Sox, the Dallas Cowboys and all UMaine teams. He and his father would yearly attend the State of Maine High School Basketball Tournaments and he enjoyed bowling, camping, singing Karaoke and riding around with his friends. Rick was predeceased by his mother, Beth Hopkins. Surviving are his daughters, Aaliyah Hopkins and Kassandra Hopkins; his father Barry Hopkins; his siblings, Missy Hopkins Turner and her husband Jamie and Mike Hopkins and his fiancé Danielle; his many aunts, uncles, nieces, nephews, cousins and friends including his dear friends, Rick “Pom” Pomeroy, Jeff Mosher, Jake Boyle, Tony Runci, Dave Watt and Tammy and Rick Salisbury. Visitation hours will be held from 5-7 pm on Wednesday April 17, 2019 at Riposta Funeral Home, 182 Waldo Ave., Belfast ME. In lieu of flowers, donations may be made in Rick’s name to Belfast Oncology. To send flowers or a remembrance gift to the family of Rick "Hop" Hopkins, please visit our Tribute Store. "Email Address" would like to share the life celebration of Rick "Hop" Hopkins. Click on the "link" to go to share a favorite memory or leave a condolence message for the family.